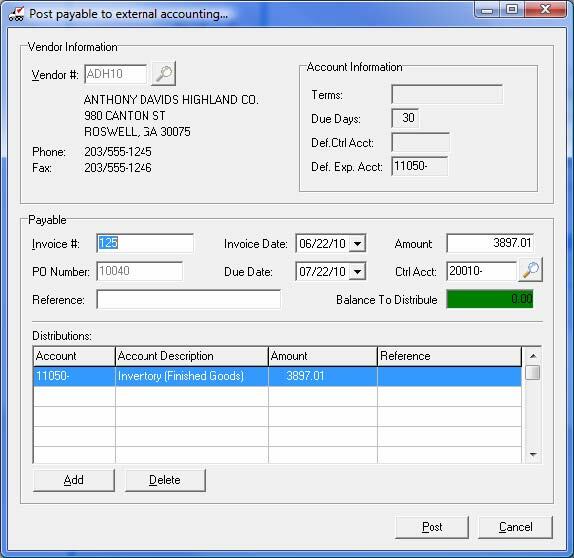 The NECS entrée.QB software allows you to easily link your entrée system with QuickBooks(*) for AP (Accounts Payable) and GL (General Ledger) purposes. All versions of QuickBooks (2002 or later) are supported. All other activity, such as invoicing, entry of customer cash receipts, accounts receivable, etc. is handled through entrée as normal. This module is especially valuable if a food distributors accounting staff or CPA firm is trained and proficient in QuickBooks, and you want to continue to use it for GL and AP purposes only. No longer will there be any kind of double entry needed, as entrée.QB automates the communications between both systems. 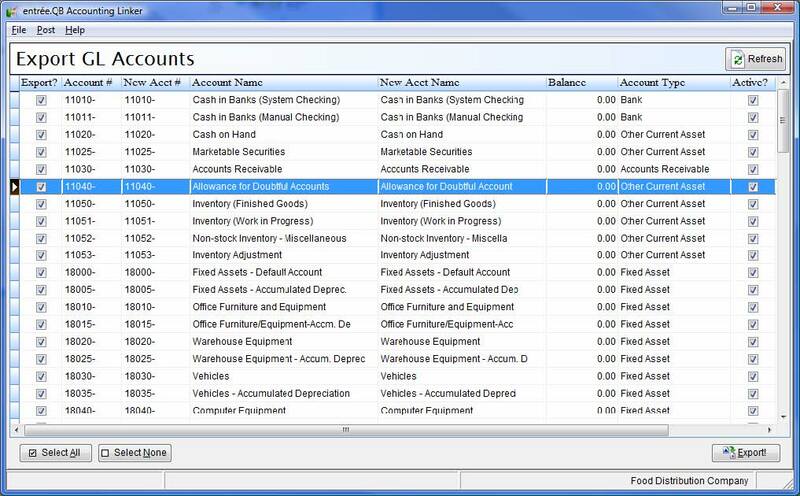 When using QuickBooks GL features, you share a common Chart of Accounts and can release your entrée data in either a "Summary" (one entry per general ledger account) or "Detail" (each sales and cash receipt transaction posted as a separate journal entry) format. When using QuickBooks AP features, you will link your Vendors and can create payable entries based upon received purchase orders in entrée. The entrée.QB software module will synchronize GL Accounts between entrée and QuickBooks to ensure the accuracy of your Chart of Accounts. 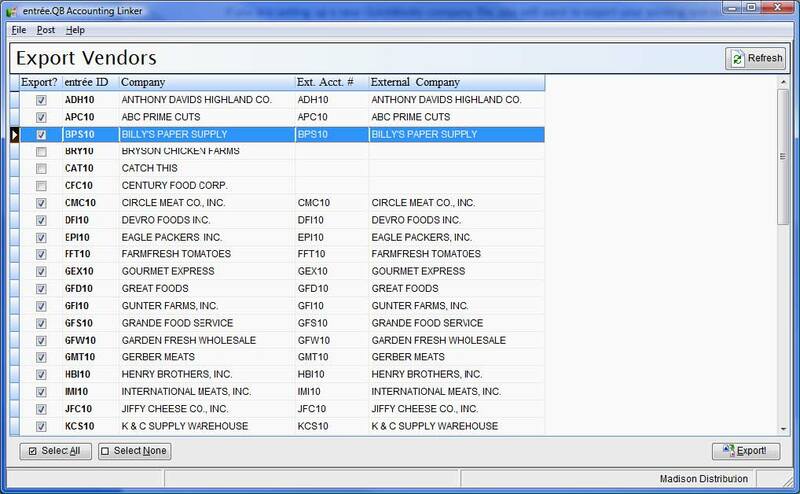 Typically GL accounts are pulled into entrée from QuickBooks using the Import GL Accounts utility. However as part of the initial setup of entrée.QB, you can export an existing entrée GL account file into QuickBooks. Your entrée vendors must be linked or exported into QuickBooks before any purchase order payables can be posted into QuickBooks. Typically vendor accounts in entrée are linked into the corresponding vendor accounts in QuickBooks. However as part of the initial setup of entrée.QB, you can export any vendors in entrée into QuickBooks or import QuickBooks vendors into entrée. After receiving a vendor's purchase order in entrée and all quantities, weights and costs are approved, you will be prompted to close the purchase order and create a payable entry in QuickBooks. This payable entry will include the invoice number from the vendor, invoice date, dollar value of received inventory, payment due date, reference information and the vendor defined GL liability account / control accounts. You can then apply distributions to one or more GL asset or expense accounts, the total of which will offset the amount that was posted to the control account. By default the total dollar value of the received purchase order is posted as a distribution to the vendors default expense account. This allows you to precisely and properly post to your GL based upon what was purchased and how it should be applied to each of your defined GL accounts. (*) QuickBooks is a registered trademark of Intuit.